BALFATE, Honduras, May 15 2017 (IPS) - In Balfate, a rural municipality that includes fishing villages and small farms along Honduras’ Caribbean coast, the effects of climate change are already felt on its famous scenery and beaches. 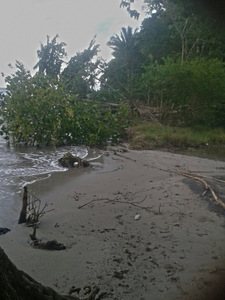 The sea is relentlessly approaching the houses, while the ecosystem is deteriorating. “What was it like before? There used to be a coconut palm plantation before the beach, and a forest with howler monkeys. Today there are no palm trees and the howler monkeys have left,” environmental activist Hugo Galeano, who has been working in the area for over three decades, told IPS. “Where the beach is now, which used to be 200 metres inland, there used to be a thick palm tree plantation and a beautiful forest. Today the geography has changed, the sea has swallowed up much of the vegetation and is getting closer and closer to the houses. The effects of climate change are palpable,” he said. Galeano coordinates the Global Environment Facility’s Small Grants Programme (SGP) in Honduras, and is one of the top experts on climate change in the country. He also promotes climate change mitigation and reforestation projects, as well as community integration with environmentally friendly practices, in low-income areas. The municipality of Balfate, with an area of 332 square kilometres and a population of about 14,000, is one of the localities in the Caribbean department of Colón that makes up the coastal corridor where the impact of climate change has most altered the local residents’ way of life. Río Coco, a village in the municipality of Balfate is increasingly near the sea. Located in the central part of the Caribbean coast of this Central American country, it is a strategic hub for transportation by sea to islands and other remote areas. To get to Balfate you have to travel along a partly unpaved road for nearly eight hours from Tegucigalpa, even though the distance is only around 300 km. To reach Río Coco takes another hour, through areas where the drug trafficking mafias have a lot of power. “We are also guilty, because instead of protecting we destroy. Today we have problems with water and even with the fish catches. With some kinds of fish, like the common snook, there are hardly any left, and we also are having trouble finding shrimp,” he said. “It is hard for people to understand, but everything is connected. 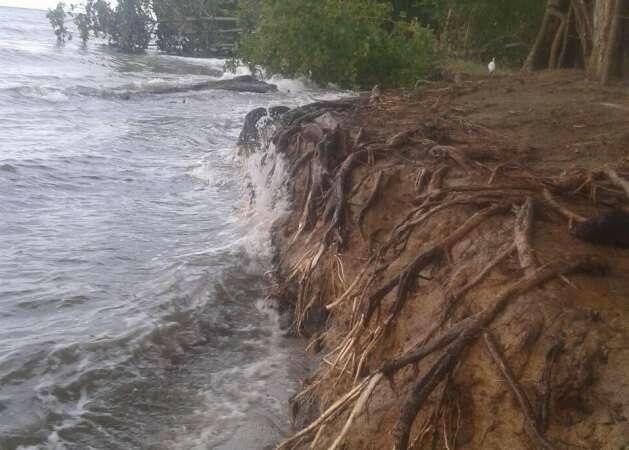 This is irreversible,” said Jiménez, who is the coordinator of the association of water administration boards in the coastal areas of Balfate and the neighbouring municipality of Santa Fe. Not only Colón is facing problems along the coast, but also the four departments – of the country’s 18 – with coasts on the Caribbean, the country’s eastern border. In the northern department of Cortés, the areas of Omoa, Barra del Motagua and Cuyamelito, which make up the basin of the Motagua River, near the border with Guatemala, are experiencing similar phenomena. In these areas on the gulf of Honduras, fishers have also reported a substantial decline inT fish catches and yields, José Eduardo Peralta, from the Coastal Sea Project of the Ministry of Energy, Natural Resources, Environment and Mines, told IPS. “The sea here has encroached more on the beach, and on productive land, than in other coastal areas. With regard to fishing, there are problems with the capture of lobster and jellyfish; the latter has not been caught for over a year and a half, save for one capture reported a month ago in the area of Mosquitia,“ in the Caribbean, he said in his office in Tegucigalpa. Peralta said the government is concerned about the effects of climate change, because they could reach dramatic levels in a few years. Honduras is considered by international bodies as one of the most vulnerable countries in the world to climate impacts, as it is on the route of the hurricanes and due to the internal pressures that affect the wetlands, such as deforestation and large-scale African oil palm plantations, which have a direct effect on water scarcity. 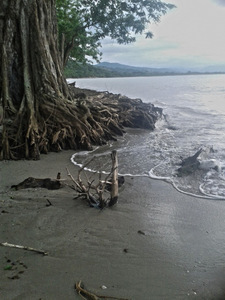 Ecologist Galeano said official figures show that in wetland areas, there are approximately two hectares of African oil palms per one of mangroves. He said it was important to pay attention to this phenomenon, because the unchecked spread of the plantations will sooner or later have an impact on the local ecosystems. On Mar. 9, Environment Minister José Antonio Galdames launched the Climate Agenda, which outlines a National Plan for Climate Change Adaptation for the country, whose implementation recently began to be mapped out. 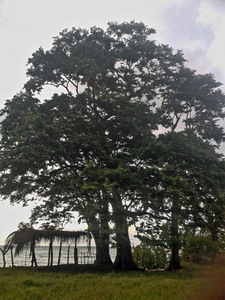 Among the measures to be carried out under the plan, Galdames underscored in his conversation with IPS a project of integral management of the Motagua River basin, which will include reforestation, management of agroforestry systems and diversification of livelihoods at the productive systems level. Hurricane Mitch, which caused incalculable economic losses and left over 5,000 people dead and 8,000 missing in 1998, tragically revealed Honduras’ vulnerability. Two decades later, the climate impact is felt particularly in the Caribbean coastal area, which was already hit particularly hard by the catastrophe. According to the United Nations, 66.5 percent of households in this country of 8.4 million people are poor.